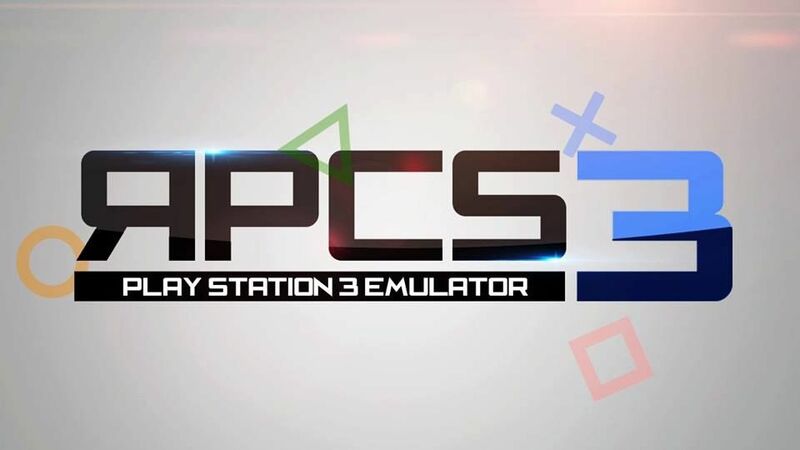 RPCS3 - Blog RPCS3 – Page 2 – RPCS3 is an open-source Sony PlayStation 3 emulator and debugger written in C++, developed for Windows, Linux and BSD. 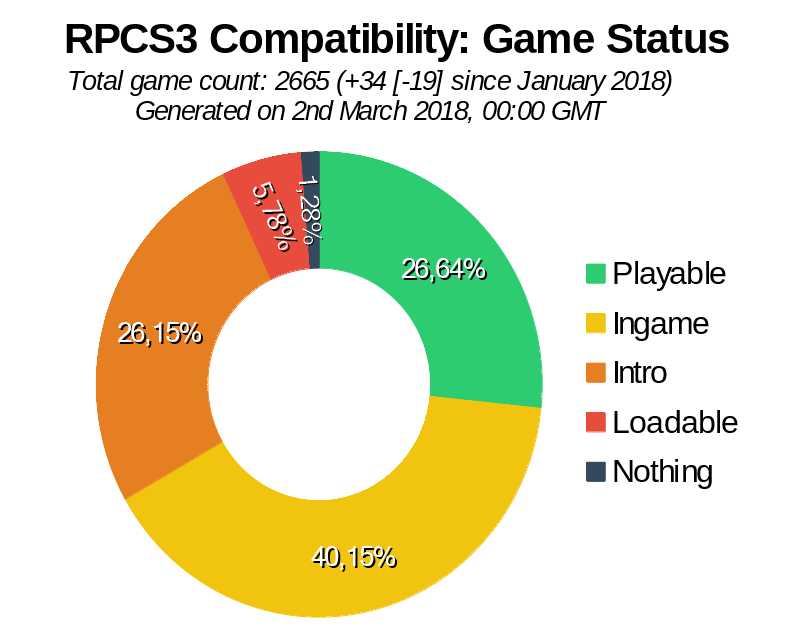 March has been an amazing month full of progress for RPCS3. This month marks the first time that games in the “Nothing” category fell beneath 1%! We had massive strides in graphical accuracy, along with improvements in SPU performance and game compatiblity. From giant pull requests that generated tons of hype, to a small typo fix that had unexpectedly wide-ranging impacts, this month has had it all. 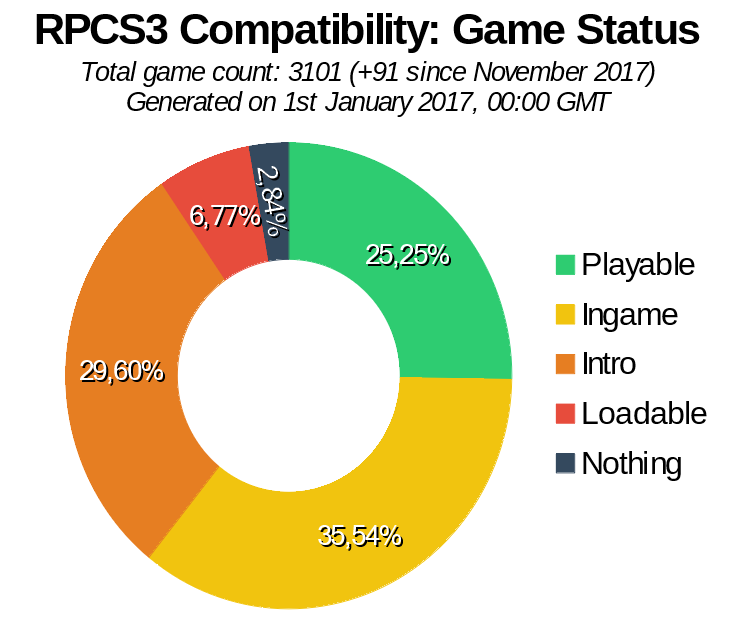 Below are the usual compatibility database statistics, with all metrics moving in the right direction. The tiny number of games left in the Nothing category is quite exciting, especially considering this was the largest category not long ago. 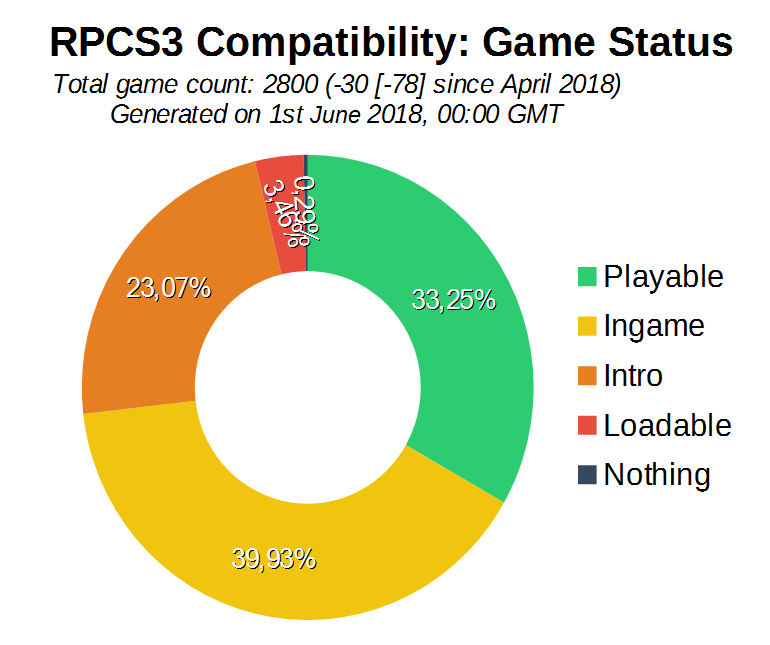 RPCS3 has reached version 0.0.5! The full change log since 0.0.4 can be read here, but the highlights are massively improved compatibility (nothing section is down to 1.34%! ), better AVX-512 and AVX2, as well as input improvements and profiles. We also saw the end of PSP2 emulation in RPCS3. While it remains alive in a separate branch, the Vita emulator has been removed from master in light of the Vita3K project. kd-11 also implemented a native user interface, allowing for games to be played fully with a controller, with the small exception of the on-screen keyboard, which doesn’t exist yet. This report will focus on the changes that happened in February, which include some exciting work slimming down the nothing and loadable sections. 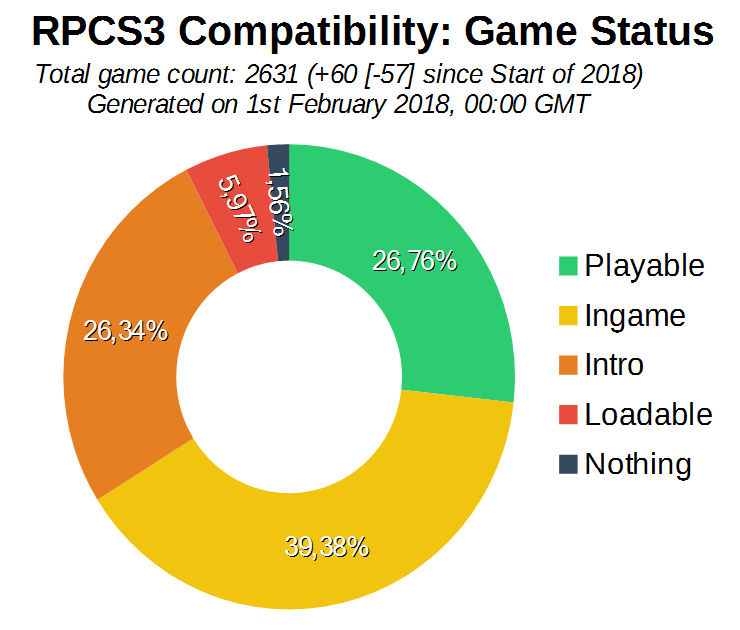 RPCS3 is within reach of having every tested PS3 game be at least in the loadable section, if not the intro section! 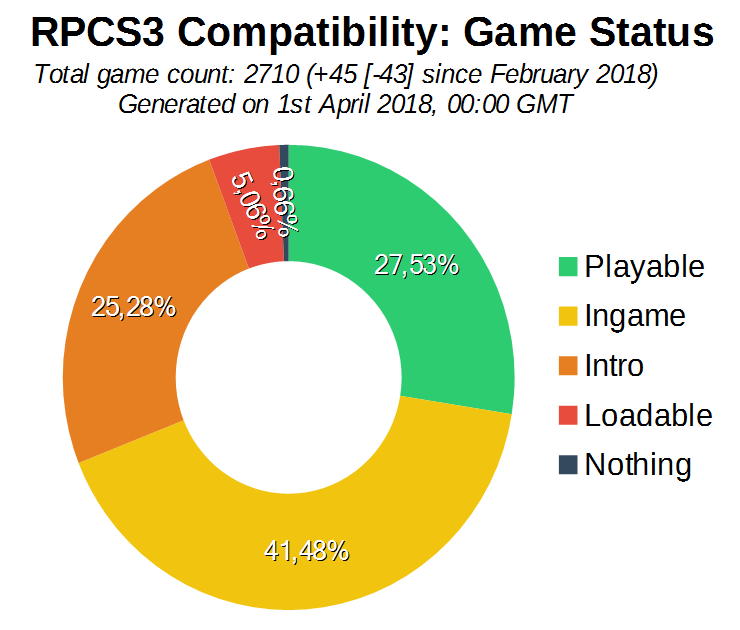 On compatibility database statistics, there’s not a big difference from last month as less games were tested, even though there were massive changes to the emulator (expect a beefier March report!). We can see an overall ~0.20% decrease on all categories except Ingame, which increases by ~0.80%. Note that we currently only have 34 games left on Nothing, and plan on making that number even smaller very soon! On GitHub statistics, 6 939 lines of code were added and 36 937 were removed through 43 Pull Requests by a total of 15 authors. What a way to end the year, eh? 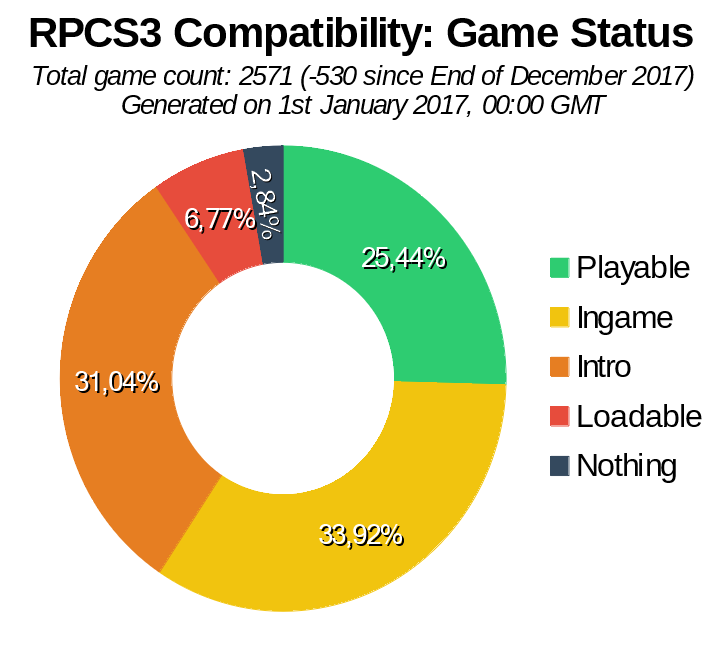 We started the last month of 2017 with a bang with RPCS3 taking major steps towards emulating many heavy hitting AAA titles, including quite a few exclusives like Uncharted and God of War. Some moved in to Loadable, others Ingame, and a few are even playable now. More can be read about this here. While these changes were made last month and received a post of their own, they had an impact on many other games that were discovered this month, and such incredible work deserves recognition. This progress report will focus on progress over the month of December. First and foremost, below is a video summary and report of various games that improved this month. Take a look, and read on for even more detail! 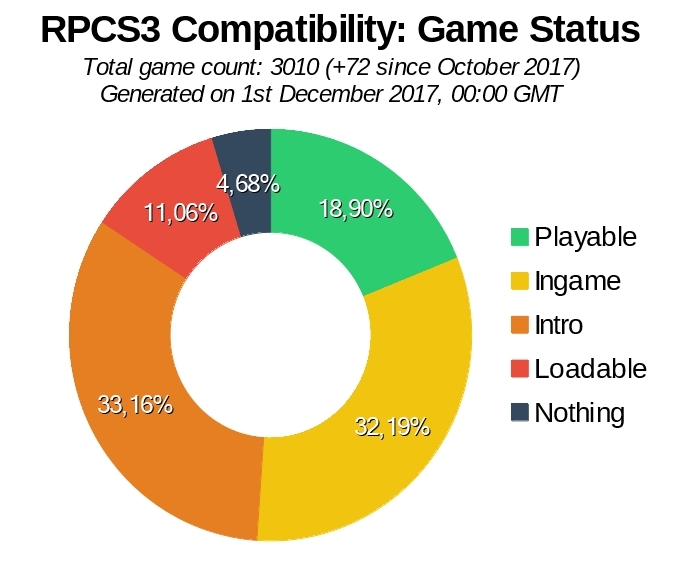 First of all, let us have a look at the compatibility database statistics. 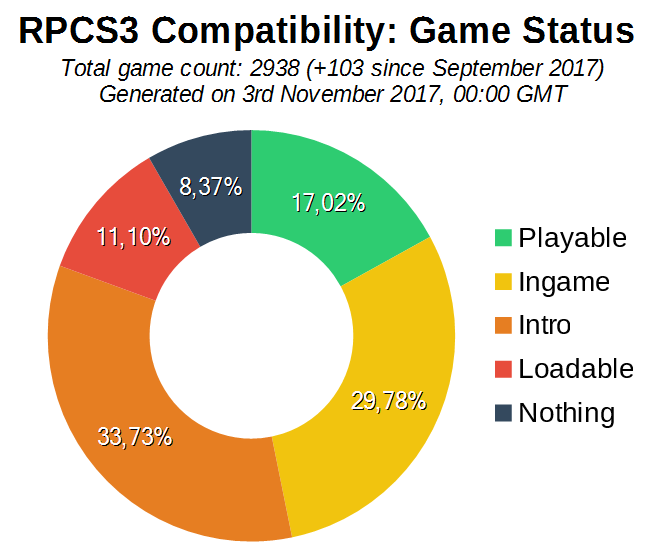 As we predicted last month the number of games in the Nothing category is now less than 100! 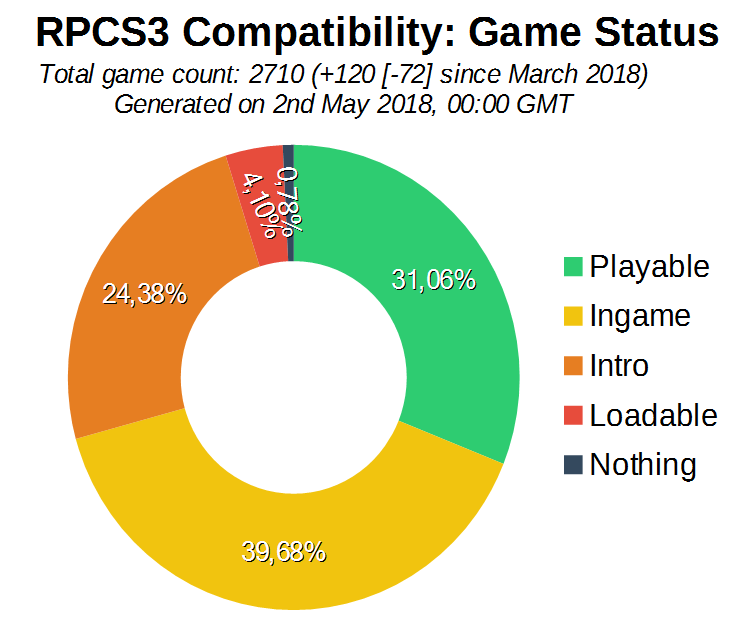 A year ago this with the Loadable and Intro categories represented the biggest chunk of registered games, most simply did not work more or less. However we are now making quite a drastic change to how compatibility is counted. Above different versions of the same game are counted separately. So for example instead of simply having one entry for Demon’s Souls, there are currently four entries: the european disc and PSN versions, and the american disc and PSN versions. This could even become six entries if someone were to test the japanese counterparts. This is a very traditional way for emulators to look at compatibility, but because of the nature of such a “modern” console like PS3, there can be a lot of different versions of the same game. We have different regions: Europe, America, Japan, Asia, Korea, Hong Kong. And for each region the disc version and the PSN version. So as can be seen below, we are merging all entries of the same game under the same media type (disc or digital), into a single entry. There are some differences on compatibility between media types, like Demon’s Souls, where only the disc versions are currently playable, while the PSN versions fail to get past a black screen. But every disc version is playable the same, and every PSN version fails the same, so it makes sense to simply count the disc versions Playable once, and the PSN versions as Nothing once in the statistics. Also note that not every game is merged yet, so the entries count is likely to go down again in the next month. Speaking of statistics, over on github 13 authors have pushed 95 commits where roughly 115 files were changed, with 5000 lines added, and 1400 lines removed. Continue reading RPCS3 Begins to Emulate Several Awaited AAA Exclusives. Here’s How We’ve Done It!